The process of downsizing and releasing stuff can be an emotional rollercoaster ride. The high of making the decision to let go and clear out excess clutter gets mixed in with the emotional and physical overwhelm of actually doing it. The realization that your kids really don’t want all your stuff and you have to decide what you’re going to do with it all can be stressful, yet some of your possessions have to go to make way for a new lifestyle. This book helps you maneuver through that downsizing process, reduce the overall overwhelm of getting it done, and helps you keep calm and focused every step of the way. Solving the Downsizing Dilemma will walk you through the journey from start to finish so you can take the steps needed to downsize your space and upsize your life! A step by step guide to taking the downsizing journey, including how to make the decision and creating a plan of action. How to let go of your stuff without burdening your kids and family with having to take it away for you. Included are Bob's Bits of Wisdom throughout the book sharing personal downsizing experience. How to stage your home to sell, organized packing and unpacking as well as how to settle into a new smaller space. Bonus Section: How to organize your downsized home room by room! If you are stressing about the future and how you will handle all the details when it is time to clean out your parents home, this is the book for you! My parents have lived in the same 5 bedroom home for almost 60 years. Although they are healthy now, it will fall to us children to move the bulk of the accumulated possessions when they need to downsize. 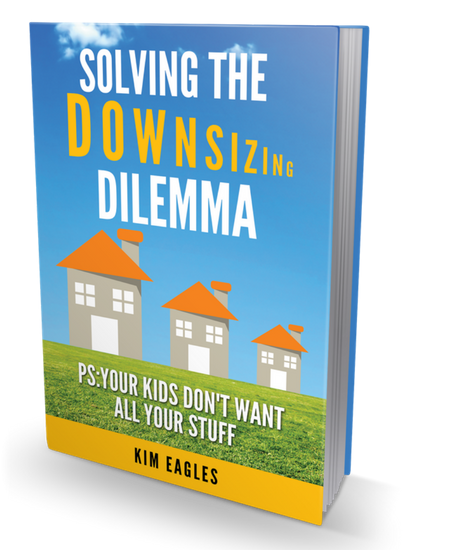 Having read Solving the Downsizing Dilemma, I have all the tools I need to make a plan and no longer have the stress of the unknown.